The space around Earth is contested and congested. The reality of how nations will fight in space is much duller and blander. And some of the key players in these conflicts will be hackers and lawyers. This form of electronic warfare in space is serious enough, however, that the U.S. military is now moving to defend its satellites and other space assets. There is in fact a real conversation under way about war in space, albeit one of cyber and electromagnetic attacks, not spaceships shooting at each other. "There are legal and practical limits on armed conflict in space," said Brian Weeden, director of program planning at the Secure World Foundation in Washington, D.C.
"Most people experience space through Hollywood movies, TV shows and science-fiction books,’ he said during an online discussion last month hosted by the American Bar Association. In almost all cases the depictions of warfare and combat in space are fictional. "They take extreme liberties and show outright ignorance of the laws of physics, orbital mechanics, conservation of energy and other things in order to make stories more dramatic and exciting." Space indeed has turned into an important battlefront, and for good reasons. It is critical to nearly all aspects of national security and military power, including intelligence, surveillance, reconnaissance, communications, precision timing and navigation, attack warning and targeting of potential threats. The issue for the United States is to figure out how to thwart attacks within the boundaries of current treaties and legal frameworks, Weeden said. "Counterspace is now part of conventional warfare because space itself is part of conventional warfare." Non‐kinetic attacks like jamming and interference are occurring more often. They are cheaper and easier to pull off than full-on kinetic destruction of satellites that would require a high-power laser or a ballistic missile. As the Pentagon maps out strategies and tactics to defend its satellites, military lawyers are actively investigating how international law applies to outer space. 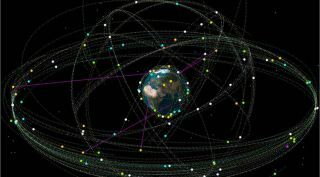 "Any operation in outer space must comply with the same law that is applicable to other domains, like sea, air and ground warfare," said Michael Hoversten, chief of space, cyber, international, and operations law at Air Force Space Command headquarters at Peterson Air Force Base, Colorado. As with other uses of military force, actions in space are restricted by international rules. If U.S. satellites were attacked, there is no ambiguity, he said. "The right to use force in self defense applies." The preeminent statute of international space law is the 1967 Outer Space Treaty, but some of the language is becoming harder to interpret in today’s environment, Hoversten said. "The treaty states that the Moon and other celestial bodies must be used exclusively for peaceful purposes" but it does not specifically say that outer space is exclusively a haven for peaceful purposes. The phrase "peaceful purposes" has been interpreted as "no military use" and also as "nonaggressive military use consistent with international law and the UN charter." The reality is that many countries use space for military purposes, he said. And most are reluctant to sign on to new treaties that might restrict their ability to exploit space in national security or economic activities. The majority view is that military use is permissible, provided that it's nonaggressive and consistent with international law and UN charter, Hoversten said. There is no consensus, however, about the meaning of "militarization" and "weaponization" of space, and different states use these terms differently. Outer space has been militarized for decades, but that is not the same as weaponization. "There is a common misconception that weapons of all kinds are illegal in outer space. That is not the case." The only specific prohibition is against so-called weapons of mass destruction — nuclear, biological, chemical and radiological. Electronic arms like lasers or jammers, or even conventional kinetic weapons can lawfully be placed in orbit, he said. Some countries, notably China and Russia, for the past decade have championed efforts to prohibit all kinds of space weapons. The United States has opposed bans primarily because of difficulties in defining what a weapon is, Hoversten explained. Theoretically any satellite that is capable of maneuvering can be used as a weapon. U.S. officials also have argued that an arms control treaty for space weapons would be unverifiable. Also a topic of debate is how the U.S. military would justify the use of countermeasures. So far it remains a fuzzy issue, said Maj. Ross Brown, chief of space, international and operations law at 14th Air Force headquarters at Vandenberg Air Force Base, California. "Below an armed attack, the most applicable response is a countermeasure," he said. But the devil is in the details. "Countermeasures must be proportional. Must not be forceful. They must be constrained. Must be reversible," Brown said. "It’s a ‘mushy’ requirement." Another concern is that the response must be "proportionate to the injury being suffered," he said. "That is difficult to measure." Disruptions to satellite links can cause material damage but also "strategic harm" if the military is cut off from access to information. As the Pentagon and others sound alarms about cyber threats to space, the reality is that very little is known about the frequency of attacks or even the scope of the danger. "Public data on cyber attacks on any satellites, military or commercial, is extremely scarce," said Weeden. "Militaries, governments, space agencies, companies are pretty reluctant to talk publicly about cyber attacks, whether successful or unsuccessful." There have been widely publicized incidents like the jamming of an HBO satellite signal in 1986 by a hacker dubbed "Captain Midnight." On the government side, Congress has openly chided NASA for cyber attacks against its aging command-and-control infrastructure. But there are very few details. "We have satellites and ground control infrastructure that are, easily, one to three decades old," Weeden said. "I don’t think it’s a stretch to really wonder just how hardened they may be against sophisticated cyber attacks. But we don’t have any good data on that." Satellite providers that are under contract to the Defense Department are required to report breaches. Otherwise, commercial companies would not want vulnerabilities or weakness known that can hurt their business and might invite additional attacks. Commercial communications providers are now investing billions of dollars in cybersecurity technologies as they seek to attract government and military customers. They are putting up high-throughput satellites with smaller beams that are more resilient against jamming. And they are shielding satellite uplinks and downlinks with Pentagon-approved encryption. Hoversten said a number of space agencies and governments are coming together to draft a new rulebook on military uses of outer space. "A comprehensive manual is a few years down the road."